When we moved to Thailand to live during my contract teaching at the university there, I broached the subject again to him. I had seen an article and a website about Sak Yant sacred tattoos and it really interested me to read about their history and spiritual significance. However, he pointed out that my bosses would definitely frown on me getting one done while I worked at the university. I continued to browse the website designs, which were now on my book marks list on my computer. The designs were so intricate and beautiful, infused with meaning and magic. Last year, my husband was very ill with cancer of the blood and bone. He told me that he understood the wish I had for a Sacred tattoo, a Sak Yant. He told me to go ahead and get one on my future travels and to pay for the best and get one that was a true work of art. So a year later and I am back in Thailand, a lone female traveller at the age of 61. Fortunately still very fit and active, I had followed his wishes and gone back to my favourite country, Thailand. There is something so special about this diverse country and its amazing people. 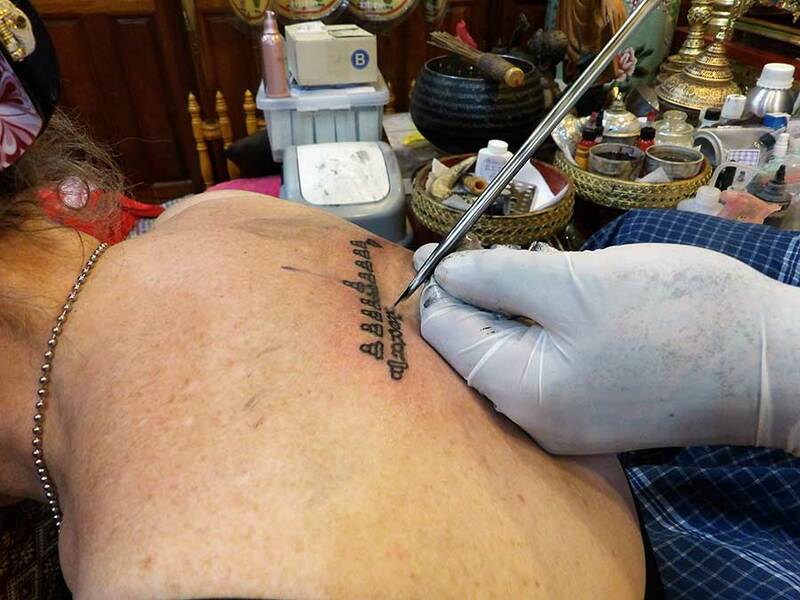 I had decided to seek out a Sak Yant Master who was willing to do a Sak Yant tattoo for a woman. Not all of them will tattoo a woman. 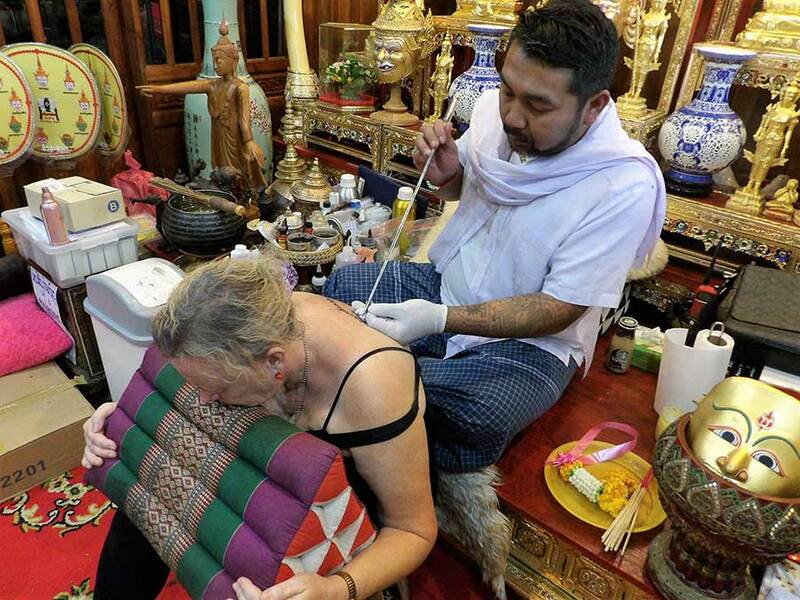 I had read about the famous temple where you could go at the crack of dawn and form a queue with all the other Sak Yant seeking Nomads who had turned up to get tattooed by the monk on duty that day. Fortunately I read many of the reviews underneath the article and had decided it was not for me. I might just be at the end of the queue and chicken out or I might just get unlucky with the needles used for more than one person in the communal ink pot. After experiencing an emergency landing at Bangkok airport this trip there was no way I was taking any more chances. I started exchanging emails with Bangkok ink about their Sak Yant service. It sounded good to me but I am afraid I was very vague as to what I actually wanted. Thankfully she had a huge amount of patience and good command of English and eventually helped me to make a decision and a date was set. I didn’t sleep the night before, partly through nerves at the thought of having my first tattoo but also because of the excitement of going through such an amazing experience. I arrived at Bangkok Ink studio early after taking the bus for an hour then the sky train. The driver welcomed me into the lovely limo and took me for my Sak Yant tattoo experience. It was about an hours drive but she gave me water to hydrate and explained what the day would entail. She was very friendly and soon put me at my ease. I went into the room where Ajarn Master was seated and waiting. The room was full of Buddhist statues and various gold masks that were beautiful. It was very peaceful and calm. I showed him the tattoo I had in mind and explained to him in Thai that I had said I felt I lost my main protector in life when I lost John. He smiled at me and told me how to sit for the tattoo on my back. The pain was not as bad as I expected and stopped as soon as the needle left my skin, no burning and no soreness. It was only painful over the spine and that was soon over. I had taken my camera and they filmed some still shots for me and a short video. It was over quicker than I thought it would be and Ajarn blessed the tattoo. They took a photo on my camera so that I could see it. It was stunning, a beautiful Gao Yord, nine spires, between my shoulders. Wow! It was much bigger than I had expected but I was thrilled with it. Obviously the Master added the bigger protection that I felt I needed. It was an incredible experience for me. I paid my respects and thanked him and went outside to offer flowers and incense to the statue in the garden. It was an amazing day and I felt happy and peaceful as I left for the drive back to Bangkok.